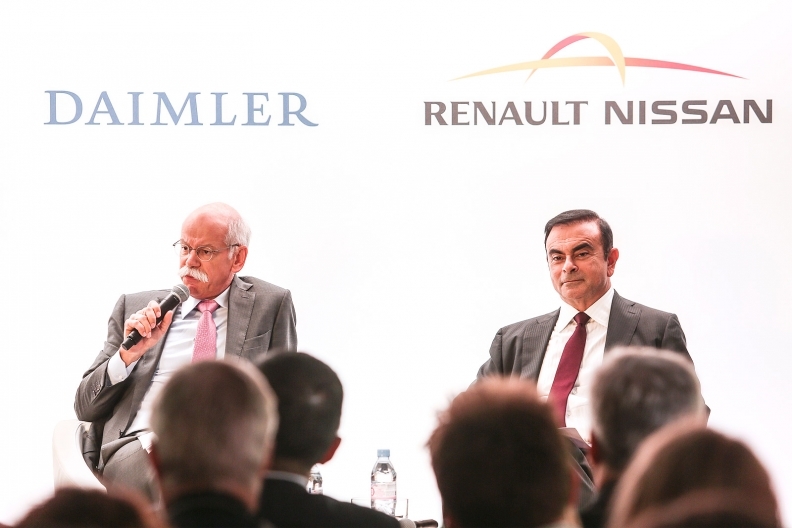 Daimler CEO Dieter Zetsche, left, and Renault-Nissan's Carlos Ghosn, in Paris last year, expanded their companies' ties. FRANKFURT (Reuters) -- Daimler and the Renault-Nissan Alliance said today their new plant for Mercedes-Benz and Infiniti cars in Aguascalientes, Mexico, will employ some 3,600 staff and have an initial production capacity of more than 230,000 vehicles. Production of Infiniti vehicles will begin in 2017 with the first Mercedes-Benz vehicles due to roll off the production line in 2018, Daimler said in a statement. Depending on market developments and customer demand, there will be potential to add further capacity, it added. Daimler and Renault-Nissan announced in June last year that they would share costs to develop and build small premium brand cars, including plans to employ up to 5,700 staff and an annual production capacity of 300,000 vehicles at the Mexican plant when full output is reached in 2021. Daimler and Nissan will also produce the next-generation premium compact cars at other production locations around the world, including Europe and China, Daimler said.